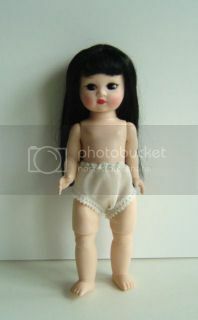 An up-market brand of American dolls of various sizes and numerous personalities, in production since 1923. Founded by the daughter of Russian immigrants, Mme. Beatrice Alexander Behrman, was raised in a flat above her father's doll hospital, and often played with the dolls waiting to be mended. This dynamic woman initiated a series of firsts in the toy industry: the first to bring baby dolls to the market, the first to create dolls in honour of living people, and the first to introduce the full-figured fashion doll (Cissy) with haute couture outfits. 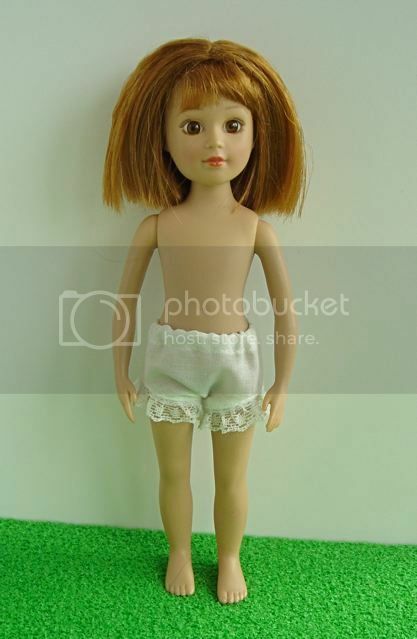 These beautifully crafted dolls 8"/22.5cm are still made today - they have utterly beautiful faces, hard vinyl bodies, closing eyes, and glued-on wigs, making them unsuitable for children who like to do lots of hair styling. Two unusual Madame Alexander dolls have come our way - they've got the same lovely little face as other dolls by this high-quality manufacturer, but these slightly newer dolls have long, thick, lustrous comb-able hair! 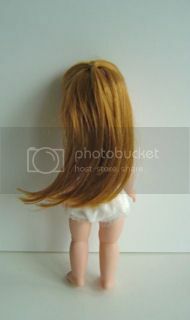 (Perfect for little girls who like to do a lot of hair styling). One has Oriental features and bendable knees; the other has long, auburn hair. A rather unusual doll from this classic, high-quality American manufacturer, which started making dolls in 1923! This modern beauty has straight, shoulder-length auburn hair, and a very slightly dusky complexion. Her hazel eyes do not close but are very wide open and realistic. She would make a lovely older sister for our other younger-looking dolls. 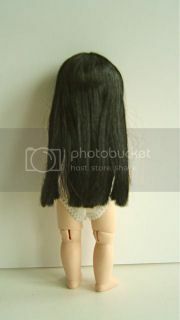 She stands 9in/23cm tall. 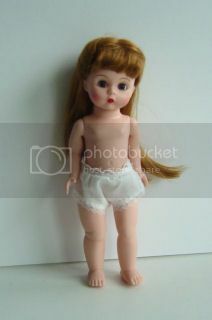 Please let us know if you would like some clothes for this doll.